Specially mentioned in the sacred Dasam Granth and Ramayana, Hemkund Sahib is a pilgrimage where a devotee feels blessed in the serene environment and experiences the divine vibrations of the pious area. Hemkund Sahib, located in Chamoli district, Uttarakhand, is a prominent Sikh pilgrimage in India. The worship area is cosseted by beautiful hills and each crest is referred as a holy Nishan Sahib. Therefore, due to its religious importance, devotees from all over the globe visit here every year. Hemkunt Sahib finds its mention in the autobiography of Guru Gobind Singh- Bachitra Natak,. But the place is supposed to be existing from the times of Ramayana. There are lots of folklore that go with Lakshman and his affection with the area. 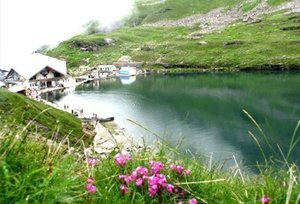 Hemkund has also been connected with Lord Shiva and Lord Vishnu. Moreover, Gobind Singh Ji also talked about his own relationship with the place in earlier incarnations. He wrote about his last live's experiences at Hemkund. The name Hemkund is derived from Sanskrit word Hem (snow) and Kund (bowl). 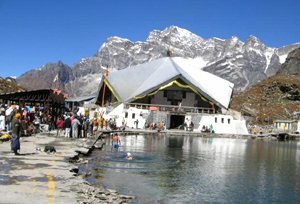 Furthermore, it is said without visiting Hemkund sahib once in life, the spiritual life of a person remains incomplete. Best time to Visit: The temperature at Hemkund Sahib generally remains between 10-24 degree Celsius, therefore, it is advisable not to visit during winters. The best time to visit is from the month of April to June. Altitude: 4329 meters above sea level. Gurudwara Hemkund Sahib: The Gurudwara Hemkund Sahib, highest Gurudwara on the earth, is located amidst an outstanding vista. The Gurdwara is devoid of any showy embellishments and the architecture is perfectly relevant to the surroundings. Hemkund Lake: The Hemkund Lake, also known as the Lokpal Lake, is about 2 km in perimeter. Its crystal-clear water reflects the Saptashrungi Peaks that encircle it. Lakshman Temple: On the bank of the Hemkund lake, stands the Lakshman Temple that is also known as Lokpal Temple. It is believed that Lord Lakshman had meditated at this place. The legendary Sanjeevani Buti that cured Lakshman after he was hurt during a battle with Meghnad is believed to be found in the vicinity. Valley Of Flowers: Along the way from Hemkund Sahib to Gobind Dham is a path that turns towards the Valley Of Flowers bordered on each side by magnificent snow capped peaks. The gorge is carpeted with more than 300 species of wild flowers like the Snake Lily, Himalayan Blue Poppy, white and yellow Anemones, Calendula, Dianthus and Daisies. A broad assortment of butterflies, black and brown Himalayan bear, snow leopard, tahr, musk deer, serow and bharals are the other attractions of the national park. By Air: Jolly Grant airport is the closest to make it to Hemkund Sahib, about 175 km away. By Train: Rishikesh (293 kms) is the nearest rail head to reach Hemkund Sahib. By Road: It is well linked to Delhi, Haridwar, Rishikesh and Rudraprayag by roads.